Beer Koozies - Low Minimums Starting at 25 Pieces! Low Minimums starting at 25 pieces! Our economy coolie is available in 11 colors. You also have the option to choose assorted light colors or assorted dark colors. 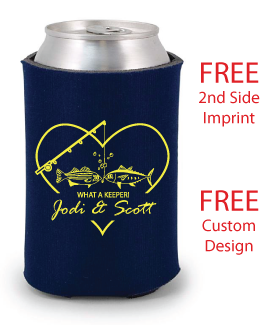 Koozies are inexpensive enough to give away to everybody at your bachelor or bachelorette party. Customize them with the date and location or even customize them with one last wish for the bride or groom before they walk down the aisle. At the end of a very long night everyone will be excited to tell their stories with a ice cold beer in their hands. Not every event calls for 200, or even 100 coolies. This is why we offfer low minimum beer koozies. Most items start at only 25 piece minimums. As long as you order the 25 pieces you can order any quantity above that! 26, 27, 47.. all ok with us! Get enough Koozies so that everybody can have one to take home; and dont forget to get enough for those ones you will mis-place after a great night of drinking with close friends. Copyright © 2016 KooziesOnline.com. All Rights Reserved.